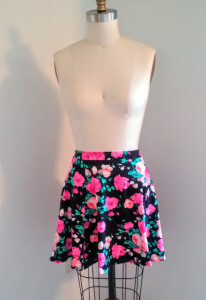 I tend not to make a lot of skirts and dresses simply because I don’t have a lot of opptunities to wear them. However, when I got this floral material in my June Knitfix bag, I knew that it had to become a skirt. Last week I mentioned that I had cut out Jalie’s half-circle\flare skirts and today I have a finished look – and I love it! 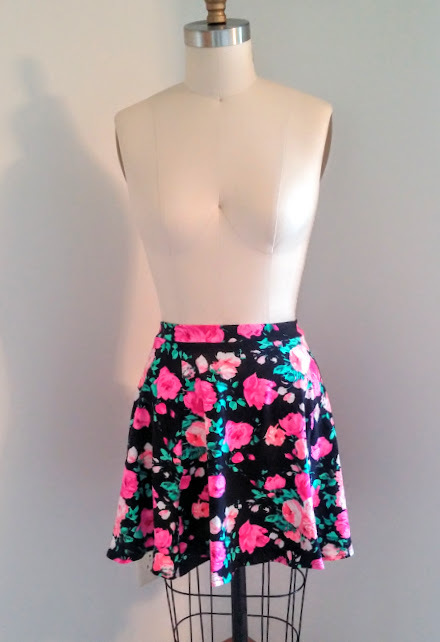 I’m really kicking myself for not making this skirt sooner… I am pretty sure that it took me longer to put the pattern together than stitch this up. My only regret is that I didn’t put the wider waistband on this – while the 1″ looks fine, I think it would have a fun retro vibe if I would have made it at least 2″ (I think I would also add a bit of elastic too because it fits a tad loose on me). Now I’m hitting my fabric stash and making a few more (definitely one in a woven) because I am pretty sure Taylor is eyeing this pattern as well! This entry was posted in Knit Fix on August 17, 2015 by stacy.